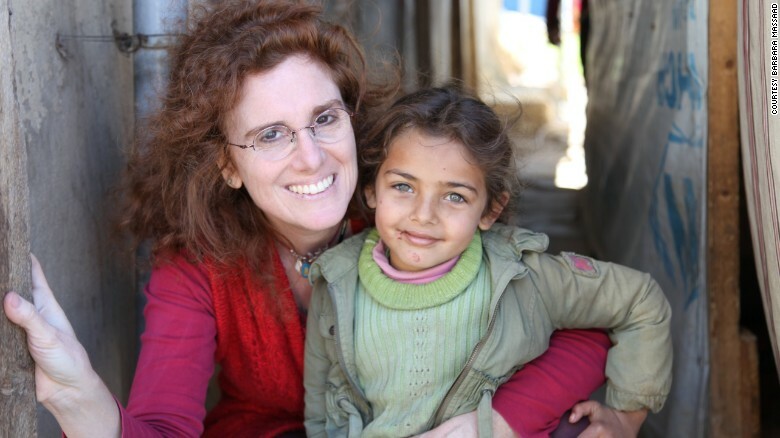 Lebanese food writer Barbara Abdeni Massaad (pictured below) volunteered at a Syrian refugee camp near the Bekaa Valley, one of many that sprouted in Lebanon, doing what came naturally to her: she cooked soup. She hauled in ingredients and tools on her frequent trips to the camp, serving up warm food to families in desperate need of sustenance and support. The experience stirred up her thinking on how to take it larger. Massaad reached out to the star chefs and foodies in her Rolodex, asking each to create a soup recipe for a cookbook to raise funds for refugee food aid. The project went global, with dozens of cooks around the world clamoring to be included. Others volunteered resources to make the book a reality; publisher Pavilion Books and several bookshops covered production and distribution costs so that most of the profits could be given directly to food relief efforts managed by UNHCR. Said contributor Anthony Bourdain, “Soup is elemental, and it always makes sense, even when the world around us fails to.” Other participants include Yotam Ottolenghi, Sami Tamimi, Mark Bittman, Alice Waters, Paula Wolfert, Claudia Roden, Sally Butcher, Ana Sortun, Greg Malouf, Aglaia Kremenzi, Joe Barza, Carolyn Kumpe, Wendy Rahamut, and many others. This is one instance where too many cooks didn’t spoil the soup! Writer disclaimer: Gift-giving is problematic for a Western ex-pat living in the Levant who seeks crowd-pleasing presents that support local causes. Purchases are further constrained by a dearth of handmade products that meet airline luggage limits. So pottery, mosaics and carpets get knocked off the shopping list. When I first spotted this cookbook, I pre-ordered several copies for US delivery to the foodies on my list. I also bought one for myself, and since returning home to Amman, Jordan I’ve been tearing through the recipes. The ingredients are fairly universal and easy to find and the recipes varied enough to keep my family with spoons at the ready. My personal favorite (so far) is a brilliantly pink beet-based soup that nearly qualifies as dessert. Heat the oil and saute the onions, garlic, leeks and fennel for a few minutes. Add the potatoes, stock, cinnamon stick, lemon peel, allspice and bay leaves. Bring to the boil, then gently simmer for 20 minutes. Remove the cinnamon, lemon and bay, and season. In a separate bowl, whisk the egg yolks and cream, then stir in a large spoonful of soup. Whisk well, then tip into the soup. Slowly return the soup to just below boiling, stirring. Remove from the heat and adjust the seasoning with salt, pepper and lemon juice. Drizzle each bowl with oil and sprinkle with cinnamon and parsley. 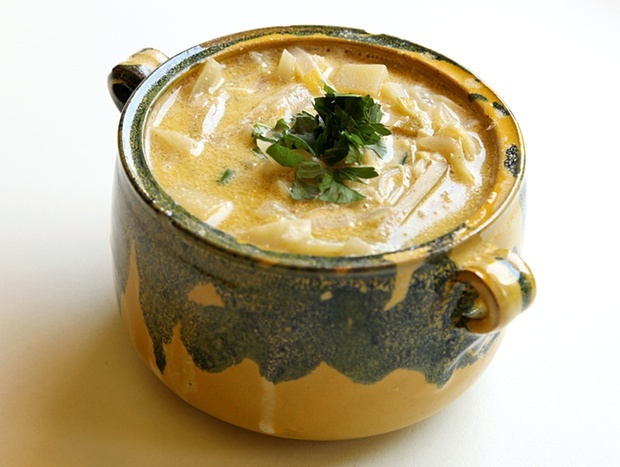 “Soup is the ultimate comfort food: nurturing, sustaining and all good things. One recipe is a drop in the ocean, but if awareness of the plight of the Syrian refugees is raised with each batch made and shared then that is a force for good. As well as being a delicious meal in and of itself,” wrote Israeli chef Yotam Ottolenghi and Palestinian chef Sami Tamimi, frequent collaborators on London-based food projects and contributors to this cookbook. Here in Amman, local friends have hosted “Souper Bowl Sundays”, inviting hungry people over to sample these recipes and make voluntary donations, which are then passed to local NGOs for refugee food relief. You could do the same for any cause of your choosing, or as a simple excuse to eat well with friends and family. Buy Soup for Syria via their website, at Amazon, or through your favorite bookseller (about $30). All images from Soup for Syria and Barbara Abdeni Massaad. Lebanese need to open up their minds and mouths on camera!